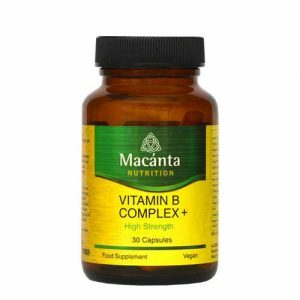 Macánta B Complex+ with Magnesium Ascorbate (Vitamin C) offers a combination of the most important B Vitamins together with Vitamin C.
Our B Complex includes the full spectrum of B Vitamins, including B1, B2, B3, B4, B5, B6, B7, B8, B9 and B12. B vitamins play a vital role within the body as they help to convert food into energy (cellular respiration). If taken as part of a healthy diet and lifestyle, this supplement may help you to improve your overall sense of wellbeing. As a food supplement for adults, take 1 capsule per day with food.